The only interactive 1930s office theatre. A fully immersive event, where the audience (employees) unwittingly dictate the sequence of play. The show revolves around one principle office nothing is quite as it seems as employees influence characters, plot twists and outcomes. The correspondents’ office, the Office of Correspondence, questions the relationship between audience and actor, testing the boundaries of traditional theatrical models. Behind the bureaucracy lies a comment on society’s acquisition of personal data, and the more covert power of big business. Enter the Waiting room seeking employment – meet other workers and the hapless transient riff-raff that plague the office. 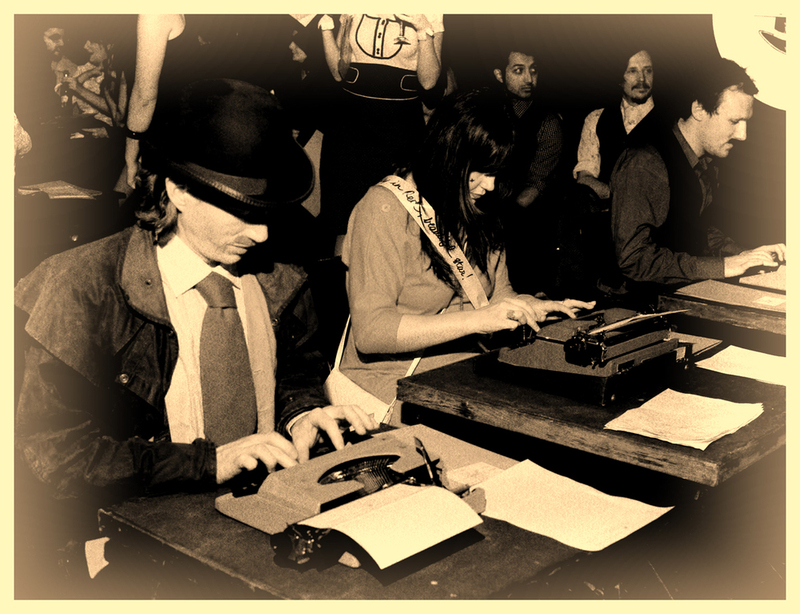 Quickly, you find yourself ushered to a chair in the typing pool, sat before a green table crowned with the majestic typewriter. From your unique position witness the chaotic pit of frenetic typists, the urgency of the workload competing with the flirtatious whimsies of its bespectacled secretaries. Fend off the advances of the outrageous office cruisers, the pandering slimy fingers of Mr Leech and the irritable pedantry of Mr Meaner. A lucky opportunity might take you to the head desk of the Boss, Mr Posh Catt Esq. and his sinister associate Mr Cutlass, where in an ostentatious flourish of Fonzarelli cash, one might find ones palms greased with a ‘special commission’ – a chance to prove one’s self by exchanging certain secret documents, spying on fellow employees, clandestine events, taking receipt of dubious horse tranquilizers or the acquisition of certain, personally revealing photo-graphs of our more ‘humble employers’, caught in a tight squeeze with a Hollywood starlet. The chaos comes to a shuddering halt when the boss rises – as do the typewriters – and leaves for the last time. In a flash the tables disperse, a grass ‘furlong’ unrolls, and the sheep-skinned race-tout barks odds for horses. Have you earnt any money in the office thus far? Do you have the wit and nerve to speculate on the royal game of hoof against turf? 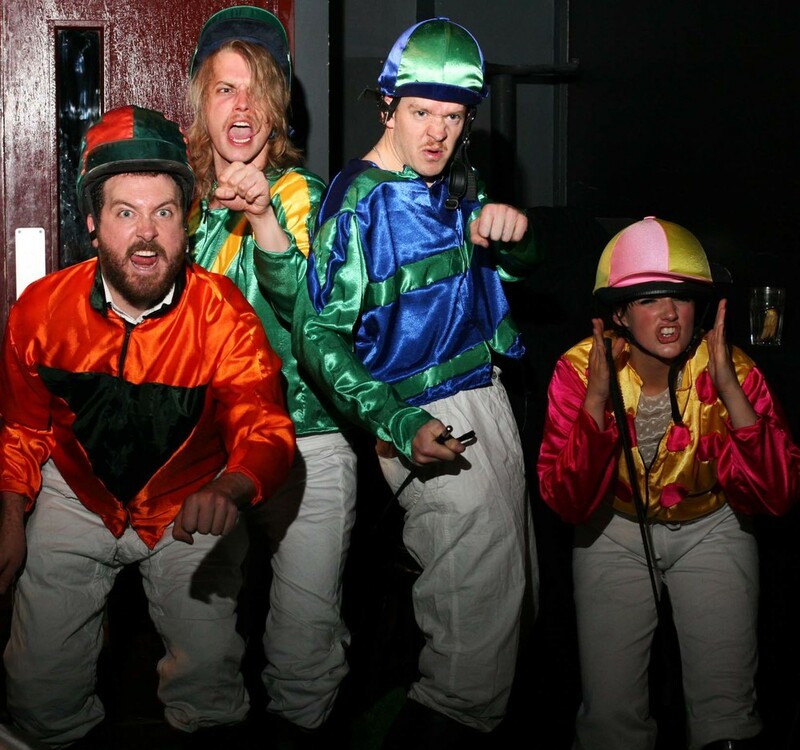 The race is on, as four silk-clad jockeys fight for the fore, their strained mouths, their stumbling feet ever pushing them toward glory and a particularly special golden handshake. 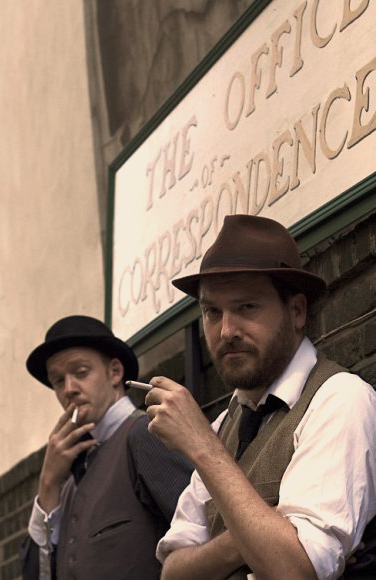 With the Office of Correspondence, FoulPlay have produced a unique performance where the audience ARE the show. Every single audience member finds their place amidst the menial tasks of an ever changing typing pool, from which they witness, and at times participate in a series of distracting comic events revolving about bureaucracy and office intrigue. This is the stunning backdrop for a fast paced comment on hierarchy, identity and indiscretion. We are each identified by the marks we make, the papers we sign and the documents we produce. Over the course of the show, the employees of the Office – the audience - steadily create documents which, through the haphazard chaos of the Office, are unwittingly assembled into a single confidential folder, presented at the close of the show as an expanded programme for re-requisition from the office – along with their P45. You have been fired. Bold characters, slapstick humour and office punctuality mask a more serious matter for the audience to ponder on their departure – the value of identity and the trading of personal information for personal gain? Ulysses Black was co-writer/deviser, printed design and performer within this production. Naturally for an Office of Correspondence, Ulysses Black and Jack Stigner created masses and masses of customised paper work: piles of money (Fonzarellis), letterheaded paper, missions, bookie slips, P45s, dismissal letters, medical letters... The idea was to inundate and saturate the performance space with paper as the efficient office becomes mired in bureaucracy. Mr Meaner and Mr Leech working the Field Office at the Streets of Brighton 2008. From the Office of Correspondence at the SHUNT Vaults. During the early months of 2008 Jack Stigner redesigned The Office of Correspondence from a festival installation to a structured and cohesive theatrical spectacular. Together with Ulysses Black they set about redesigning the intricacies of the character interactions, assessing the possible outcomes of placing power in the hands of audience, and incorporating the legerdemain and stage magic / mentalism into the sub-structure of the show, in keeping with the FoulPlay method. The result was another extremely intricate and cunningly choreographed performance that was both rich in texture and seemingly explosive in its vitality. 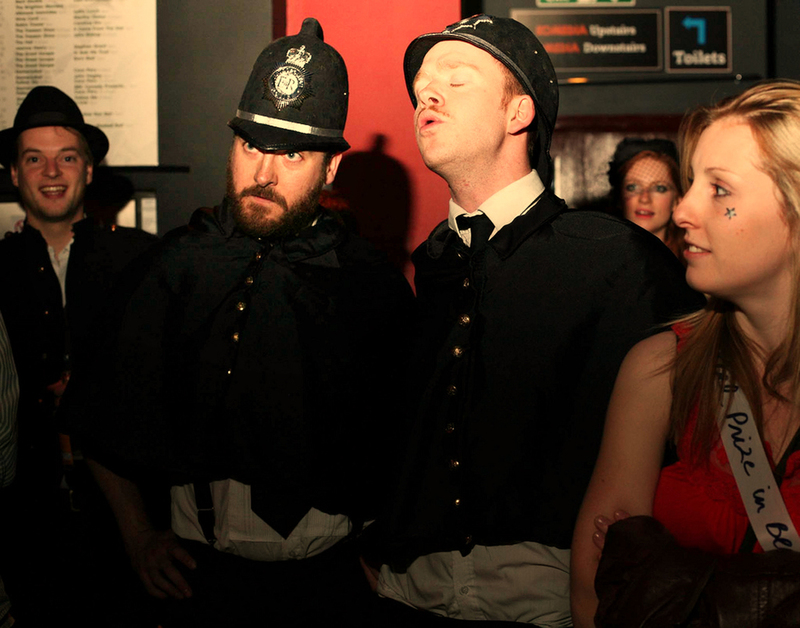 The police (Ulysses Black & Jack Stigner) arrive to search the Office. Mr Meaner (Jack Stigner) and Mr Leech (Ulysses Black) snapped by the paps during the Field Office promotional show at Brighton's 'Fringe City' 2008.